New Delhi, February 16: A day after it was flagged off by Prime Minister Narendra Modi, India’s first semi-high speed train, Vande Bharat Express ran into some trouble early Saturday morning. Officials present at the spot said that the problem arose because of “skidding wheels”. The problem is being looked at by engineers, said reports. Train 18 Fares: Vande Bharat Express Ticket Cost Slashed by Indian Railways a Day After Price Announcement. The incident reportedly occurred around 15 kilometres from Tundla junction in Uttar Pradesh. The train was coming back from Varanasi. The train was on a trial to get ready for its first commercial run on February 17. The first journey of the train will be from New Delhi to Varanasi route. Facilities in Train 18: Passengers of Vande Bharat Express to Enjoy Muffins and Patties for Breakfast and Delicious Meals During Their Travel. “It was a case of cattle run over due to which there was some problem of wheels skidding. Engineers are looking at it,” said Northern Railway CPRO Deepak Kumar. After removing the obstacles, the train resumed its journey to Delhi at around 8:15 am, officials said. Train 18, which was recently named Vande Bharat Express by Railway Minister Piyush Goyal, has been manufactured by the Integral Coach Factory, Chennai. It became India’s fastest train by hitting speeds of over 180 kmph during a trial run on a section of the Delhi-Mumbai Rajdhani route. 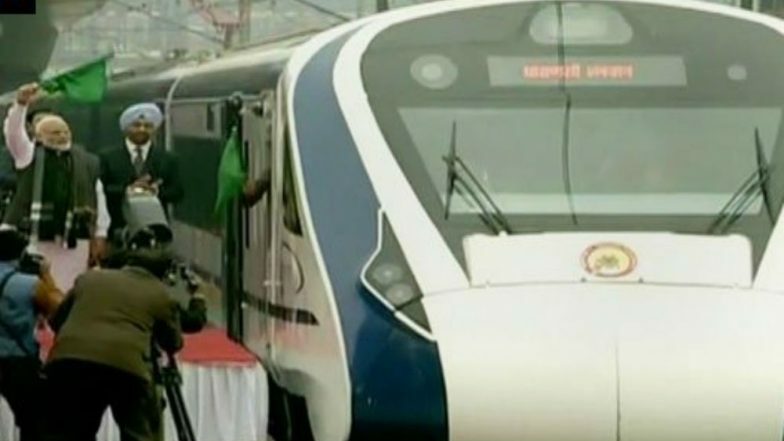 Train 18: India’s First Engineless Train Vande Bharat Express to be Flagged Off by PM Narendra Modi Today. Tickets of the first commercial run of Vande Bharat Express on February 17 have been completely sold out, a senior railway official said Friday. Bookings started for the first commercial run of the Vande Bharat Express, billed as India’s fastest train, on February 14, Thursday for the journey from Delhi and Varanasi, railways said Thursday. Tickets could be booked on irctc.co.in or from over the counter. Prime Minister Narendra Modi inaugurated Vande Bharat Express or Train 18, India's fastest train, on February 15, 2019.